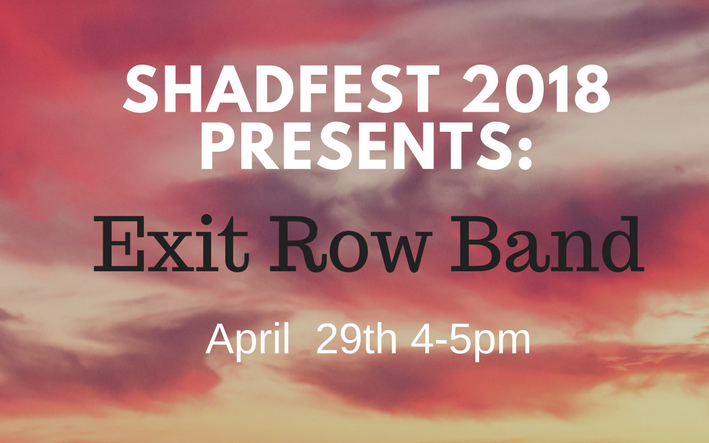 On Sunday April 29th, top rated professional private event band Exit Row Band will be the closing act for ShadFest from 4-5pm. Shad Fest is an award winning tourist attraction and New Jersey’s largest waterfront festival, drawing thousand to the banks of the Delaware River across from New Hope, PA. It will be a fun afternoon of listening and dancing to your favorite cover songs, including artists such as Tom Petty, Adele, The Beatles, Lake Street Dive, Zac Brown, Supertramp, Guns n Roses, Grace Potter, Bon Jovi, Pat Benetar, The Pretenders, Van Morrison, Queen, Neil Young, Hall & Oates, and more. About Exit Row Band: NJ’s top rated professional private event cover band: 1,000 events across the world since 2005. Entertainment before acts ranging from Peter Gabriel to Sarah McLachlan to George Thorogood, featured at New Jersey’s biggest events from QuickChek Festival of Ballooning to Shad Fest to Yelp’s biggest Event of the Year. Performed for crowds in the thousands, shows can be seen on cable stations, entertained the most exclusive clubs, played the coolest venues in NYC, Jones Beach, & several weeks each year in The Hamptons. Travel team tours several months a year, having been on stages in 14 countries, 17 states.